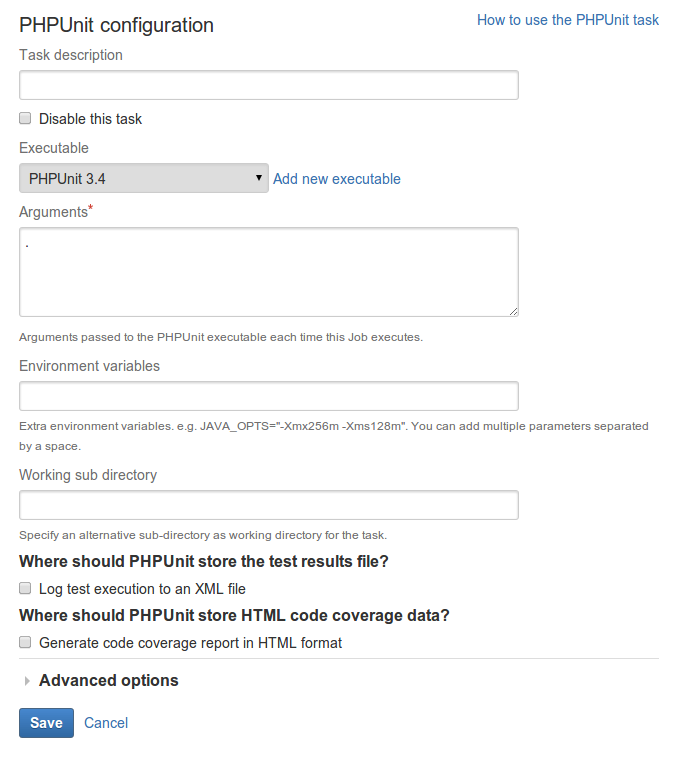 This page describes how to configure a PHPUnit task. To use this task, you will need to install PHPUnit and reference the path to your PHP command-line interpreter, (e.g. /usr/bin/phpunit on Ubuntu). Click the name of an existing task, or click Add Task and then PHPUnit (or another option, such as PHPUnit 3.3.X) to create a new task. 実行可能ファイル Select the PHPUnit executable that you wish to configure for this task (e.g. "PHPUnit 3.3.x" or "PHPUnit"). The executable that you select will become one of the task's capability requirements (and hence, one of the job's requirements). For details, please see Configuring a job's requirements . Arguments Type the name of the directory/files that will be analyzed recursively by PHPUnit. The default value is "." (i.e. the working subdirectory, if specified). You must specify at least one argument. 環境変数 (Optional) Additional system environment variables that you want to pass to your build. Note that existing environment variables are automatically available to the executable. You can also include Bamboo global or build-specific variables (see Using global, plan or build-specific variables). 作業サブディレクトリ (Optional) An alternative subdirectory, relative to the job's root directory, where Bamboo will run the executable. The root directory contains everything checked out from the job's configured source repository. If you leave this field blank, Bamboo will look for build files in the root directory. This option is useful if your task has a build script in a subdirectory and the executable needs to be run from within that subdirectory. Log test execution to XML file Select if you want PHPUnit to record test results in JUnit format. This format is also used by TestNG. Test Result File — the relative location, and name, of the file to record PHPUnit test results. Generate code coverage report in HTML format Select if you want PHPUnit to generate code coverage data in HTML format (e.g. for PHPUnit HTML Code Coverage reports). HTML Code Coverage Directory — the relative location of the directory to store the code coverage report.